David Stevens, a Nova Scotia boat builder, took the lines for the schooner BONNY (30'LOA, 8'beam) from a derelict boat in saw in a field on Bush Island. 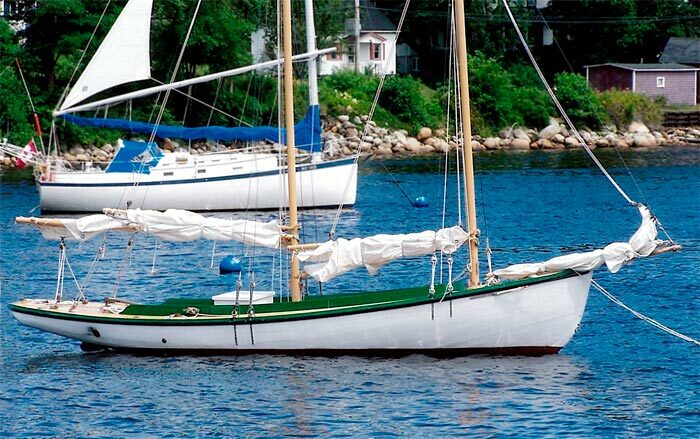 He built her as a work boat for his own use in his declining years. Sometime later Morton Caplan bought BONNY after she had been out of the water for 5 years. With the help of Butch Heisler of Heisler's Boat Yard, he refitted BONNY and launched her in July of 2006. Morton writes that BONNY led the Parade of Sail at the Mahone Bay Classic Boat Festival in August 2006, complete with a bagpiper lashed to the mast.